While attending the University of California, Riverside, Ted Hopson cooked at Mario’s Place where he trained in every kitchen position and created upscale versions of the classic Italian dishes that he grew up with. Following his graduation in 2003 Hopson attended the California School of Culinary Arts, earning his Le Cordon Bleu diploma in pursuit of a career that would allow him to share his love of restaurants and respect for cooking. He found himself working with his mentor, David LeFevre, as Executive Sous Chef at Water Grill and became an integral part of the development of its Michelin Star-winning menu. 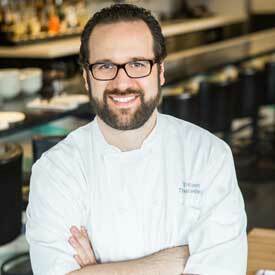 Following that success, Hopson became a major contributor in the opening of Eveleigh in the fall of 2010 as Executive Sous Chef before becoming the Executive Chef at Father’s Office and Lukshon in Culver City. With four years at the Culver City gastropub and one season of Top Chef Masters under his belt, Hopson became the Executive Chef of the national burger chain Umami Burger, manning R&D, training, and new store openings nationwide until April 2015. Chef Ted Hopson tackles his next adventure as co-owner and Executive Chef at The Bellwether, where he combines his passion for the best possible ingredients with his nuanced approach to cooking to create unique, memorable dishes.